I love Chocolate Buckeyes, but mine often come out a little misshapen. Part of it is because my favorite not-too-sweet filling is kind of soft, and part of it is because I’m not very patient when it comes to dipping things in chocolate. One day when I was feeling particularly annoyed with how my Buckeyes were looking, I did an experiment to see how the recipe worked as homemade peanut butter cups. The verdict? Better! They have a neater appearance and a higher ratio of chocolate to peanut butter, which I prefer. I still love Chocolate Buckeyes, but there’s room in the world for both recipes, so here’s the peanut butter cup variation. The yield may vary slightly depending on how thick you make your peanut butter filling rounds. 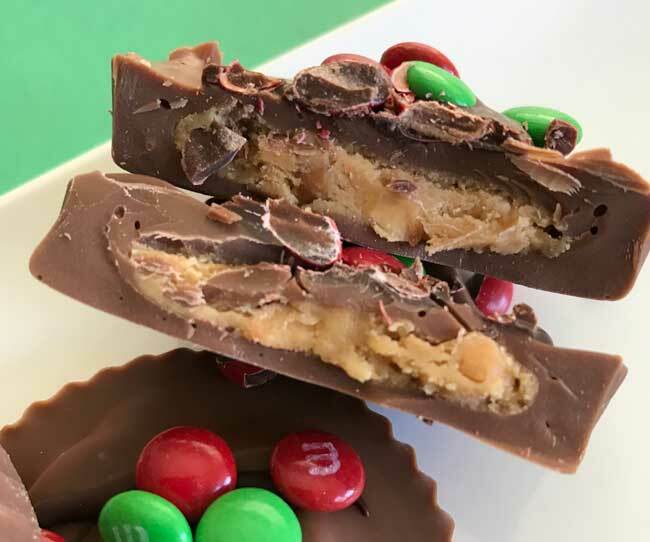 I like more chocolate and less peanut butter, but if you want to make a really thick, heavy-on-the-peanut-butter cup, you’ll get fewer rounds. 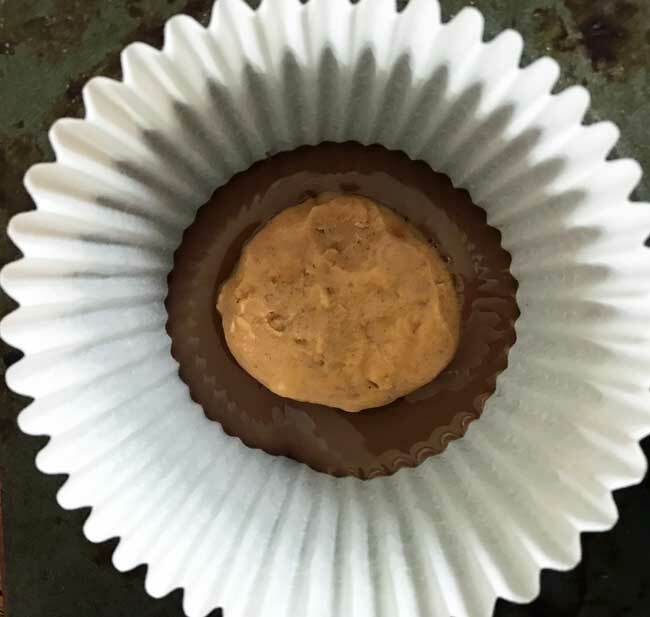 I like to make all of the peanut butter rounds, store them in the refrigerator, then make homemade peanut butter cups a few at a time whenever I'm in the mood. This recipe is for making them all at once in which case you''ll need about 18 oz of chocolate. If you don't need so many cups, you can halve the entire recipe or you can make all the peanut butter filling rounds at once (like I do) and just assemble the chocolate peanut butter cups when you're in the mood. 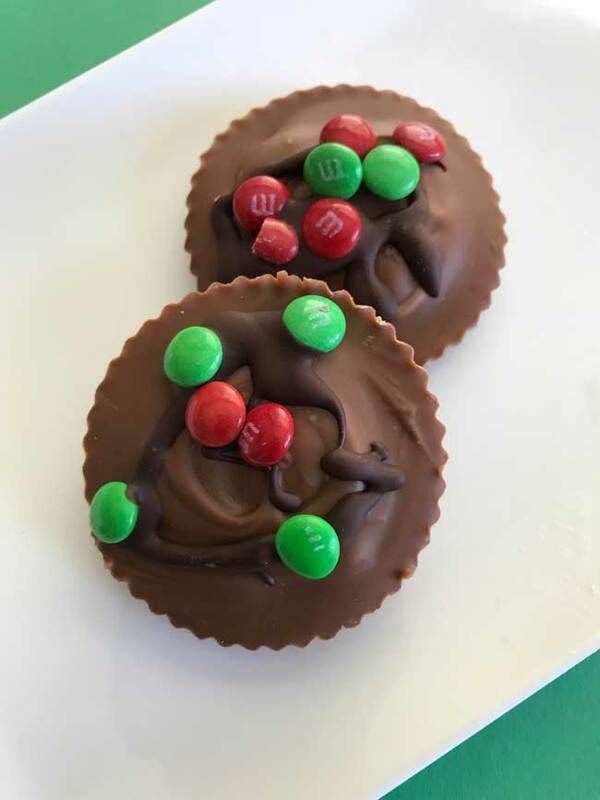 Extra chocolate or white chocolate for melting and garnishing, plus sprinkles or Mini M&Ms or whatever you think might jazz up the cups. In a microwave-safe bowl (I use my Pampered Chef Batter Bowl), mash the white chips and butter together so that the chips are coated with butter. Melt the white chips in the microwave using 50% power and stirring every 30 seconds. Set aside. Add the peanut butter to the melted white chips and stir until smooth, then stir in the vanilla and the powdered sugar. The dough should be fairly soft at this point. Using about a teaspoon measure, scoop out little mounds of peanut butter mixture and arrange them on a plate lined with plastic wrap. You should get about 32 depending on how you scooped, but the yield may vary. Chill the scooped mounds until they are no longer sticky, then shape into little balls. Press the little balls into rounds. Put all of your little peanut butter rounds in a zipper bag and keep them in the refrigerator until you are ready to assemble the cups. To make the peanut butter cups, line 12 muffin cups with paper liners. Put 8 oz of chopped chocolate in a microwave-safe bowl and heat to melt. If using semisweet chocolate you can melt it at high power and stir every 30 seconds. If using milk chocolate, use 50% power and stir every 30 seconds. If using chocolate chips, you may want to add ½ teaspoon of coconut oil or shortening for every 3 oz of chips, but this is optional. When the chocolate is completely melted, spoon a little chocolate over the bottom of each paper liner. Do not try to paint it up the sides or make a nest. I tried that it made things worse. All you have to do is just smooth it flat. Take 12 of your peanut butter rounds and stick a round in the center of the chocolate. Spoon remaining chocolate over the peanut butter rounds. Put the muffin tin in the refrigerator to set the chocolate. If you are in a hurry, you can put it in the freezer. When firm, peel away the paper. Repeat the whole procedure using the remaining peanut butter rounds. You’ll need at least 3 oz of chocolate for every 5 peanut butter cups. Store the assembled peanut butter cups in the refrigerator or freezer, then serve at room temperature. Before making these, I usually run over to Walgreen’s and buy a few bars of whatever chocolate I’m in the mood for. Cadbury Dairy Milk, Lindt Milk, any brand of dark or semisweet OR Ghirardelli bittersweet chips all work really well. You can personalize the cups by using a certain type of chocolate. The notes on chocolate are especially helpful! Thanks!